Jointhepipe.org and Vitens have joined forces to provide clean water across the globe. Jointhepipe.org is a non-profit organisation which aims to ensure fair distribution of drinking water worldwide, as well as to discourage the usage of bottled water. At Aquatech, a trade show for water technology in Amsterdam, Jointhepipe.org and Vitens signed a Memorandum of Intent to prioritise the provision of safe water worldwide. Having already worked together several times, the two organisations plan to continue their hard work in encouraging the people to drink tap water by installing public water taps. Jointhepipe.org has produced a public tap water station, which Vitens is responsible for installing. Thus far, six of the eight public tap water stations produced have been installed by Vitens in Urtrecht, Netherlands. Along with Urgenda, an independent organisation in the Netherlands which promotes sustainable living, a national campaign was launched – “I jump over – to tap water”. 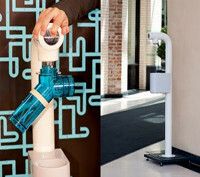 Jointhepipe.org has requested that the tap water stations be installed nationwide, in many public areas such as parks, museums, and public transport stops, and Vitens provides the installation free of charge. With the tap water stations come durable BPA-free water bottles, shaped like parts of water pipelines, which are intended to make the tap water stations easier to use on-the-go. From the proceeds of Jointhepipe.org products, funding is put towards maintaining water and sanitation projects such as water wells and water pumps in developing countries across Africa and Asia. Jointhepipe.org keeps the progress of these projects updated on the website for donors to follow. Vitens is the largest water company in the Netherlands, providing top quality drinking water to 5.4 million people, delivering 350 million cubic metres of water annually.